Carol Ann Duffy - Poetry Live! Luckily for Carol Ann Duffy (and for her readers) she had English teachers who encouraged her to write, drawing out her passion for language. ‘It taught me to love words for their own sake. Originally I liked stories and things, but by the time I was a teenager, poetry was my real love. It was at a time when poetry was more popular. Kids would go to poetry readings the way they would go to pop concerts’. After school she met the Liverpool poet and artist Adrian Henri and later took a philosophy degree at the university of Liverpool. In the next decade she moved to London and became a full-time poet, publishing collections of poetry which were critically acclaimed, quickly popular with a wide audience and also won her a series of major poetry prizes. She now lives in Manchester with her daughter Ella. In 1995 she was awarded an OBE and in 2001 a CBE. She teaches poetry at Manchester Metropolitan University. 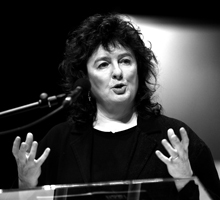 In 2009 Carol Ann Duffy was appointed Poet Laureate. Her latest collection The Bees is her first since becoming the Poet Laureate and won the 2011 Costa Poetry Award. She has been a prolific and very popular laureate, writing on a number public events, including the MPs’ expenses scandal, the deaths of Harry Patch and Henry Allingham (the last surviving First World War veterans), the Post Office’s decision to do away with county names on letters, a response to the recent inquest into the Hillsborough tragedy; as well as putting together an anthology for the Queen’s jubillee, called Jubilee Lines, for which sixty poets contributed a poem each for every year of Elizabeth II’s reign.